The remarkable thing about imperfection is that indeed it’s epitome of beauty and it can teach us a valuable lesson. Today I was stressing out a little bit about my car. My car needs to be serviced soon. I went online to research what I needed and instead found a thread that explains how my model has problems with carbon deposits. I immediately thought, how can this be? I paid a fortune for the car and it has this design imperfection? My mind raced as I thought about how I’d soon need to find myself a new car because I didn’t think my car was good enough. I don’t even know that my car in fact has this imperfection. I assumed it because I read something on the internet. I stopped and thought some more as I was driving home this evening. I love my car. It’s safe, reliable and perfect for my lifestyle. It gets me to work, it gets my child to school and we’ve spent time taking it on family trips. Until recently, it was “the” car we took on long trips. I then decided I don’t care if it has this imperfection. Imperfection is a reality of life. You are always getting something with flaws. Nothing or no person is entirely perfect. We are all designed differently and come our own uniqueness. I know our 365 X 24 X 7 go-go world would like you to believe you have to get an A+ paper every time. Not so. 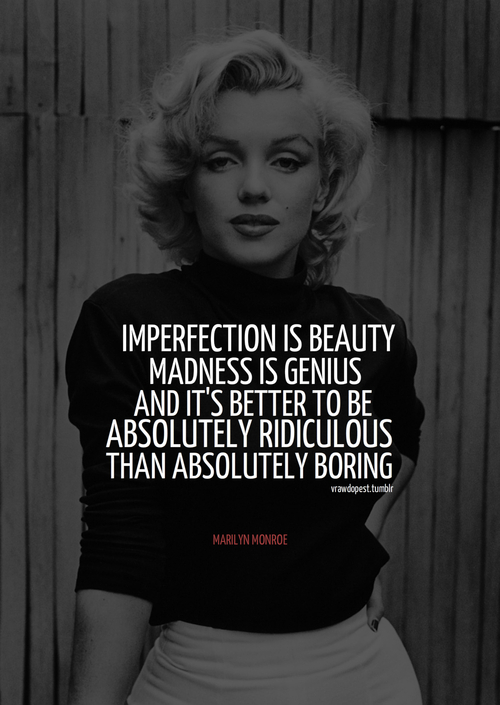 Go on ahead… Embrace imperfection.